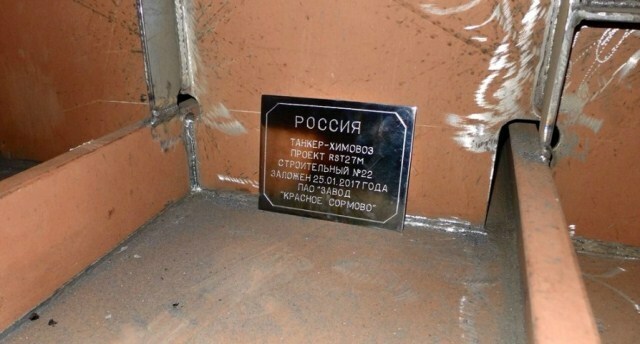 Nizhny Novgorod, Russia based shipyard Krasnoye Sormovo (United Shipbuilding Corporation) has laid down the lead chemical carrier of Project RST27М, Volga-Don Max class, under the contract with State Transport Leasing Company (STLC), says Marine Engineering Bureau, the designer of the series. In 2017, the shipyard is going to build and deliver to BF Tanker three chemical carriers of Project RST27М. Two more vessels will be delivered in the first half of 2018. Volga-Don Max Vessels of Project RST27М meet the dimensions of the Volga-Don Ship Canal and Volga-Baltic Waterway. LOA - 140.85 m, beam - 16.6 m, depth – 6.0 m, crew - 12 persons (14 places + pilot). Sea/river endurance – 20/12 days. As compared with Project RST27 the vessels of Project RST27M feature an enhanced sea function. The tanker design takes into account special requirements of Russian and international oil companies as well as additional environmental restrictions of Russian Maritime Register of Shipping «ECO PROJECT» (ECO-S). The ship is intended for transportation of crude oil and oil products with density between 0.7 and 1.015 t/m3, as well as hazardous liquid substances including those requiring heating of up to 60°С, with no flash point limits. Up to three types of cargo can be carried by the tanker simultaneously. Krasnoye Sormovo PJSC is one of the oldest shipbuilding companies in Russia, founded in 1849. Throughout the 75-year period, more than three hundred submarines and rescue vehicles including 25 nuclear ones have been built and modernized by Krasnoye Sormovo shipyard. Today, Krasnoye Sormovo builds vessels of commercial fleet meeting the requirements of international conventions on reliability and safety.